Worldwide sales of smartphones to end users reached 336 million units, an increase of 19.3 per cent during the first quarter of 2015. According to Gartner, this growth was led by strong smartphone sales in emerging markets (excluding China); the fastest growing regions were emerging Asia/Pacific, Eastern Europe, and the Middle East and North Africa. Due to these high-performing regions, the emerging markets achieved a 40 per cent increase in sales during the first quarter of 2015. “During this quarter, local brands and Chinese vendors came out as the key winners in emerging markets,” says Anshul Gupta, research director, Gartner. 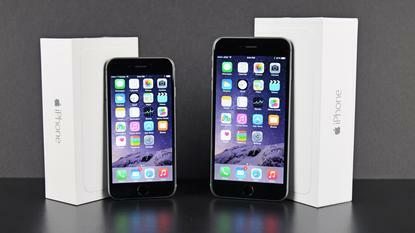 Apple continued to exhibit a strong performance in the quarter, particularly in China. 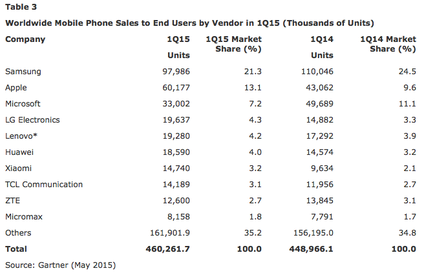 iPhone sales were up 72.5 per cent during the first quarter of 2015, making Apple the No. 1 smartphone vendor in China - just ahead of Xiaomi - for the first time. Greater China also became Apple's largest volume market, ahead of North America, thanks to strong sales in China during the first quarter of 2015. “Apple’s extension into more Asian markets helped it close the gap with Samsung globally,” Gupta adds. Amongst the top five global smartphone vendors, Samsung continued to see a decline in sales and share during the first quarter of 2015. ”Despite a weak first quarter globally, Samsung's performance returned to growth quarter-on-quarter, with an 11 per cent increase from the fourth quarter of 2014,” Gupta adds. In the smartphone operating system (OS) market, Android's share fell by 1.9 percentage points, while iOS grew year-on-year for the third consecutive quarter. “Strong iPhone sales in China during the first quarter of 2015 had an impact on Android's performance in that country,” says Roberta Cozza, research director, Gartner. “Android’s volumes fell by 4 per cent year-on-year in China for the first time. The performance of Windows Phone remained flat, mainly due to a weak ecosystem and a less desirable mobile brand, together with a strong and established competitive smartphone market. With the features and core capabilities of OSs evolving rapidly and becoming increasingly similar, it is now critical for OS providers to find ways to differentiate themselves. They need to extend their OS ecosystem's reach by adding new functionalities, and build platforms that can span multiple devices types. Worldwide mobile phone sales to end users totalled 460.3 million units during the first quarter of 2015, a 2.5 per cent increase from the same period in 2014. “In light of their strong smartphone sales in the emerging markets, the Indian and Chinese phone manufacturers increased their footprint during the first quarter of 2015. Six of them were in the top 10 in the first quarter of 2015,” Gupta adds.